Chery Mobile announced their high definition smartphone @ their Facebook Fanpage "Cherry Mobile Flare HD". So, what do we expect on this new model? By the name itself, the Flare HD is HD at 720p (720 x 1280 resolution), along with that a slight increase in its battery capacity to 1800mAh. Despite the advertised Mali400 GPU, after a run on AnTuTu benchmark it was found out to be MediaTek MT6589 + PowerVR SGX 544 GPU the same combo on most affordable Quadcore smartphones today (ex. Arc Mobile Nitro 450QD). 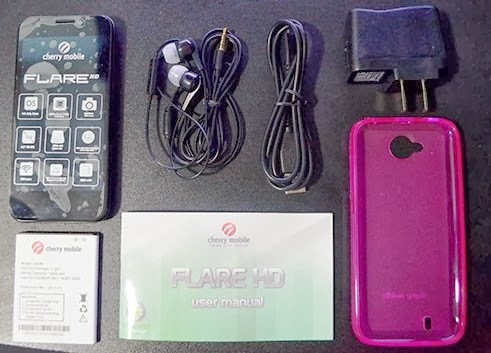 Released on January 8, 2014 at selected Cherry Mobile Stores, it is expected to be available soon on provinces, eventually Lazada and other major online stores will have this phone earlier than physical stores. As usual, the battery life of 1800mAh for a Quadcore phone plus retina display will be shorter than ever. But don't worry, the graphics are vivid and the HD images are great things to compromise with. Well, there is a bunch of tutorial on how to prolong battery life on the net, take time to search its worth it.